This is the first recipe I tried out of the new slow cooker and casserole cookbook and it was so good and very easy to assemble. I don't care for the thought of seafood for a brunch item so I made it for supper, served along with salad and fruit. Soup would probably complement it well also. 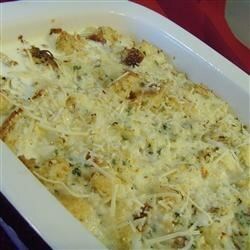 I did not add any salt as there is plenty in the cheese and canned crabmeat I used. It didn't need any. I baked mine in a 7 x 11 dish. I would probably double this recipe for more than 4 people, if it is the only maindish you are serving.